How our live chat software works! You asked for it and now it’s here. 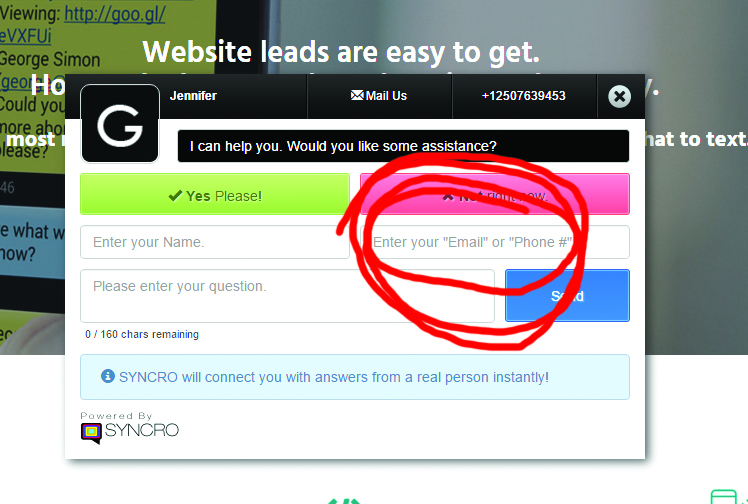 Your customers can now choose whether they want to enter in a phone number or their email address when making initial contact with you using SYNCRO. The leads will still be stored in your control panel, but the contact data will default to the number or email that your customer entered. 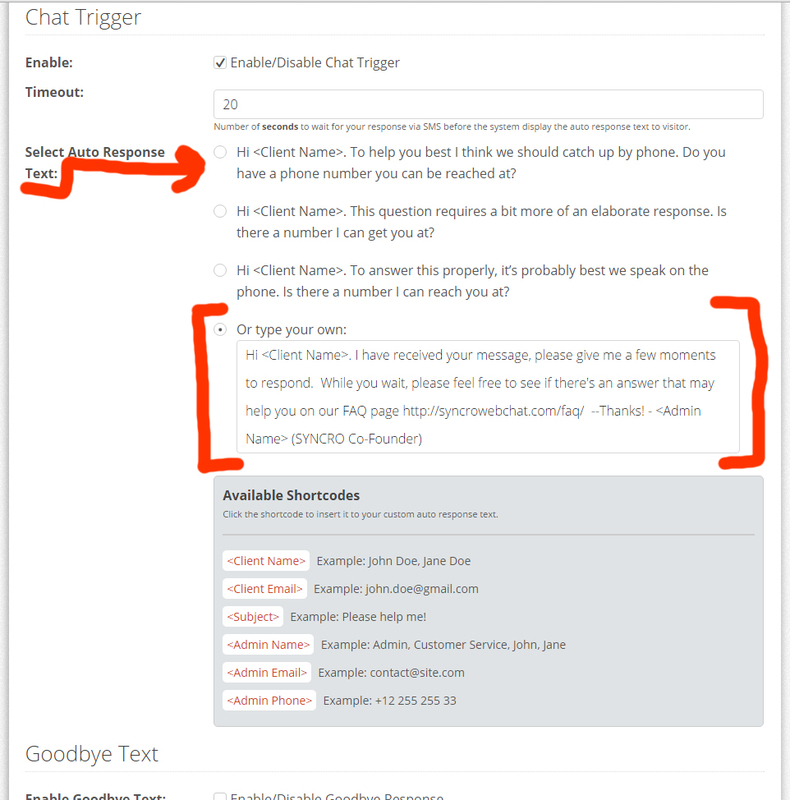 If you are still looking to get both pieces of information for a more complete lead, then please visit the Chat Trigger section in your control panel and choose from one of the pre-written statements or create a custom response. Alternatively, we’ve found being uber responsive will open the doors for all the data you need and even better – more conversions. Notice how the country flag appears to indicate that the user has entered in the correct country and area code for their location and number to match. Keep your feature requests coming! 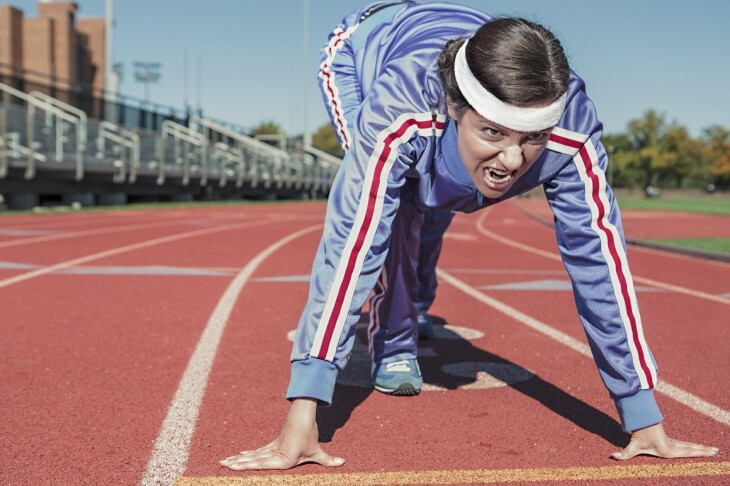 Be more responsive to your online leads with these 5 tips. Make the most of incoming interactions and how a Moooooing cow changed my sales game. We’ve all been there before- a lead comes in from your website somewhat “unexpectedly” and because you weren’t ready for it, you don’t respond in time and you can’t seem to re-engage with the customer. It happens a lot. And there are a lot of reasons why. 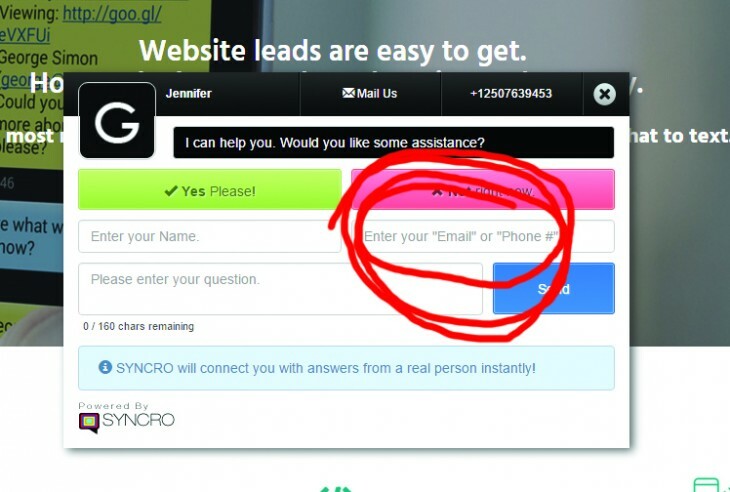 The installation of SYNCRO should help you cut down on (if not all together cut out) these incidents of missed sales opportunity, but following the tips below will help you to be as responsive as you can no matter how you generate online leads. This is an easy one. Login to your settings and under the ‘advanced’ tab, you can adjust the hours of operation that you’re available. If you aren’t available to chat during specific hours of the day then the SYNCRO live chat widget will automatically remove itself from your website. That’s a key feature to consider when evaluating chat tools. There’s nothing worse from a customer’s point of view than having a live chat tool option that always seems to be ‘offline’. If you know that you’re slow on the texting draw or always on the move in your car, then set up your auto responder to explain exactly how you do business. Your customers will love the transparency and sometimes they won’t even know that it’s a canned response. We have some great options pre-canned in the admin under settings and ‘chat trigger’ for you to use or you can customize your own. Make sure that you set your time value appropriately as well, keeping in mind that your customer will not want to wait more than a minute for a response. This is mistake number one! As a society we’ve turned so polite that often we only ever have our phones on vibrate or worse, completely silenced. This is great for funerals, church, movies and more, but when you’re trying to get sales it’s hardly beneficial. Turn it on and turn it up (at least during the hours your SYNCRO schedule is enabled). Tun up the volume for more leads! Programming my mobile to the sound of a Moooooooing cow was the game changer for me personally. I get a lot of texts, emails and other notifications during a regular work day. I wanted to know what was urgent and what I could let go for a few extra moments if I was in the middle of something else. How did I accomplish this exactly? 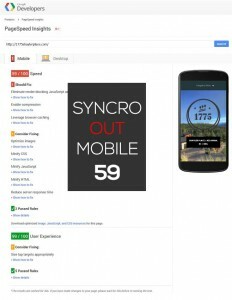 Add the SYNCRO number to your contacts in your mobile phone. 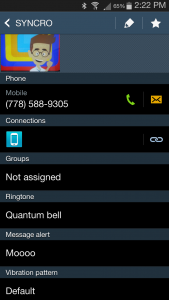 I named my contact SYNCRO and then added the number 1 (778) 588-9305 as a mobile. Assign a special message alert tone that only SYNCRO’s will have. Mine is a cow that obnoxiously Mooo’s. It’s very distinct and it lets me know to drop everything and find my phone because I have a website lead that’s hot to trot. My kids even know when I have a SYNCRO now and will run and bring me my phone to respond. See point 3. You need to have the volume in order for this to work. Keep in mind that sometimes your customers are in a rush and want the answer so quickly that they’ll jet within minutes of that first contact going unanswered. Their email address is a great way to follow up with them and offer your assistance. It shows that you’re proactive and care about their business – so long as you’re reaching out within the same 24 hour period. Waiting longer than 24 hours to follow up will likely not help you in your effort to close more sales. Got an email bounce? Again your customers might be in a rush, or may not trust you enough yet to provide a real address. Try Google searching their first and last name along with the email they provided and see if you can track them down. A little detective work can go a long way! Those are 5 tips that worked wonders for me and I think they can also work to help you convert more of that website traffic using SYNCRO website live chat to text message. Generating the live chat to text message embed code is as easy as 1-2-3. When you sign up for a SYNCRO account you will automatically be presented with a step by step set up wizard to guide you through how to install the embed code to enable live chat to text on your website. 2.) Find and click the ‘Manage Sites’ tab. Click ‘Add New’. From here you will be able to add the website URL where you will be installing SYNCRO and generate the embed code that is required to set up your live chat to text message widget. 3.) If you have any issues with your install please let our team know by either SYNCRO’ing with us or sending over an email to support@syncrowebchat.com and we’ll be happy to help you get on your way! Don’t Text and Drive. Chat Trigger Will Save your Life and your Leads. There’s a lot of things we love about texting. It’s instant, it’s easy, quick, anonymous and it generally makes life easier. The one major downfall about texting isn’t the guesswork of trying to figure out the tone of the conversation as it unfolds or analyzing response time from friends trying to discern whether or not they’re ignoring you or just for real busy, but is certainly more serious than ego and affects every human on this planet. It’s the doi-yoi’s out there that still think texting and driving is cool. 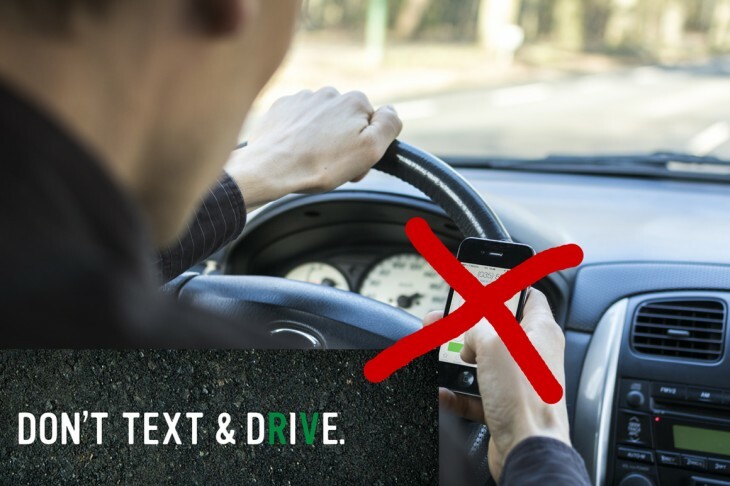 The dumb dumbs that think not texting and driving doesn’t apply to them, because somehow they’ve mastered mad texting skills that absolve them from this dangerous form of multitasking. If you’re one of these “cool” humans that are still “too busy” to put down your phone whilst in your vehicle then maybe we can convince you to change with our Chat Trigger feature. With Chat Trigger you can still capture all the details of your received messages via text message and email and our system will also instantly notify the sender on your behalf that you’ve received their message and you’ll respond when you are able to do so. This nifty form of immediate automatic response will not only satiate the message sender for the time being, but will also quash your anxiety to provide an instant response. Let’s face it, not only is it dangerous to respond to texts, emails and non bluetoothed calls and in some places (why not all?) illegal, but it’s also not necessary to be that on the ball! Think about what we did before the advent of mobile devices and understand that no response is more important than your own life or the lives of others out there on the road. However, if you want people to know you’re not being anti-social, and haven’t dropped into the realm of no signal-ville then hook SYNCRO up to your website and give them a something to chew on until you can safely send back your response. Safety first kids. SYNCRO has your back. Website Live Chat. Does it affect the loading speed of your website? 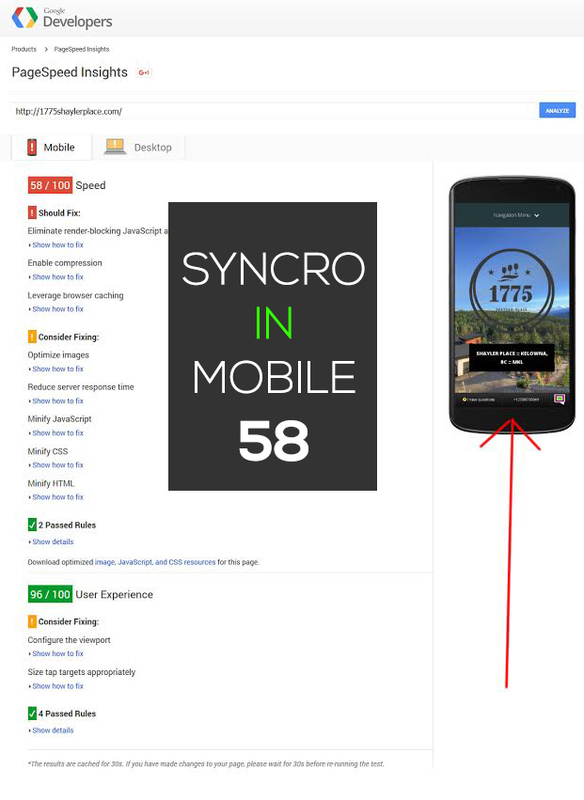 We’re myth busting around the SYNCRO office today, with a neat little DIY article on website speed and how to benchmark your personal website before and after your SYNCRO install. We live in an on demand world and waiting for a website to load isn’t part of our instant gratification vocabulary, so obviously why wouldn’t you want your website to be lightning fast? Unfortunately, there are actually lots of reasons as to why it could be bogged down and more often than not they are things left to the control of your web developer, ISP or server host. It likely won’t be the addition of a quality application such as SYNCRO or another live website chat solution that would cause the bottleneck to your website load time. We know this because we make a concerted effort to build “good” software and we also test and measure everything we do, because nerds like to know that stuff and we definitely have our fair share of those guys kicking around this office. So how can you take this little test on your own? It’s simple. With the help of Google. We encourage you to visit Google’s handy little developers page called Page Speed Insights https://developers.google.com/speed/pagespeed/insights/ All you’ll need to know is your domain name and how to type and you’ll have the results of your page load time in mere moments. For anyone who is concerned about website load time and how a tool like SYNCRO might affect how fast your site loads up on both a mobile device and a desktop computer we encourage you to visit Google’s Page Speed Insights page and do a test before SYNCRO is added to your website and then do the exact same test after the embed code has been added. It’s just that simple to find out the truth in your load time woes. If you don’t want to use your site as a guinea pig, we totally understand (we’re against animal testing too) so we’ve given you an example below. Take a look and let us know in the comments what kind of results you guys are pulling in. 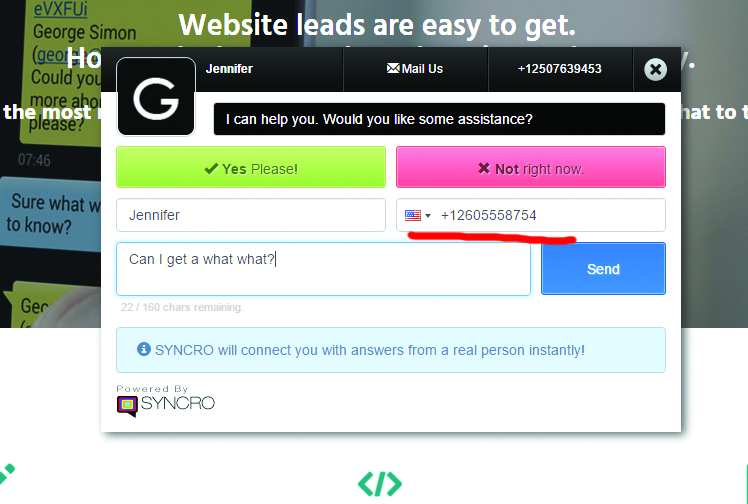 This is a typical website using SYNCRO to field live chat to text message leads. 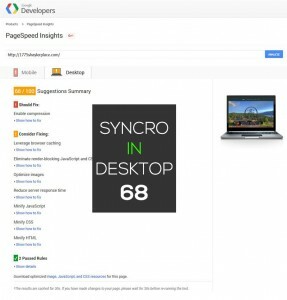 Before we put SYNCRO into the website we did a speed test using Google’s developer tools and you can see that the website scores 69/100 on a desktop computer. And here’s the same website a few moments later with SYNCRO now added into the mix. The site now scores one point less in the speed test with a 68/100. As you can see the difference is negligible and it is very unlikely that most humans would notice the difference in speed. We have also included the same results for the same website but using a mobile. 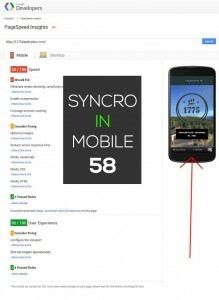 The same results were achieved, with a 59/100 score for the website without SYNCRO and a 58/100 with SYNCRO installed. Again, the install caused a very insignificant difference. This difference is expected but nothing that is going to significantly reduce the load time on your website. And that friends, is a very simple DIY speed test you can perform on your website. I think Martha would be proud. That’s a good thing. 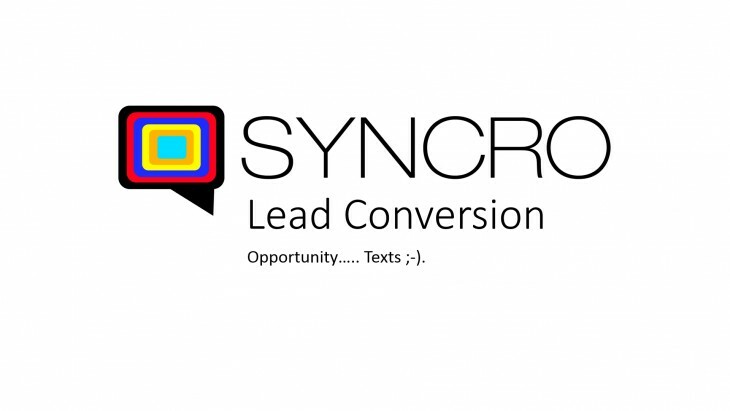 Opportunity texts ;-) SYNCRO delivers. Instantly. Copyright 2015- Web Chat to Text Message. Toll Free: 877-762-9453 | Phone: (250) 763-9453 | #901-773 Glenmore Road Kelowna, British Columbia Canada, V1V 3B9. The SYNCRO web to text chat tool may incur data and roaming fees depending on your carriers terms and conditions. Patent pending.